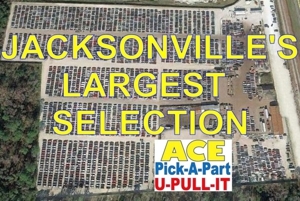 Ace Pick A Part has the largest selection of Used & Rebuilt Auto Parts in all of Jacksonville since 1986. Our auto salvage yard has over 3,000 Vans, Trucks, Cars and SUVs. We carry the cheapest auto parts for Acura, BMW, Keystone, Dodge, Ford, GMC, Honda, Kia, Lincoln and so much more! FREE 12 months parts warranty on most parts. Cheap Prices on our Super Selection of Quality Used Car and Truck Parts. FREE 365 Day Exchange Warranty on most parts. Come by Ace Pick A Part to look at our Used and Rebuilt Auto Parts collection or bring us your used auto parts! Join Ace Pick A Part's contact list for sales events, coupons, incoming vehicles and more here. Or give us a call at (904) 515-4336. Copyright © 2018 acepickapart.net All rights reserved.